While meandering along the edges of Lake Logan today, I noticed numerous bright, black and orange-colored bugs that seemed to be congregating on the milk weed plants. (Milk weed is the 3-4 foot tall plant that is commonly seen throughout the summer, with the big green seed pods that open up in the fall releasing seeds that float around on fluffy white parasols.) It turns out this particular insect is the Large Milkweed Bug. 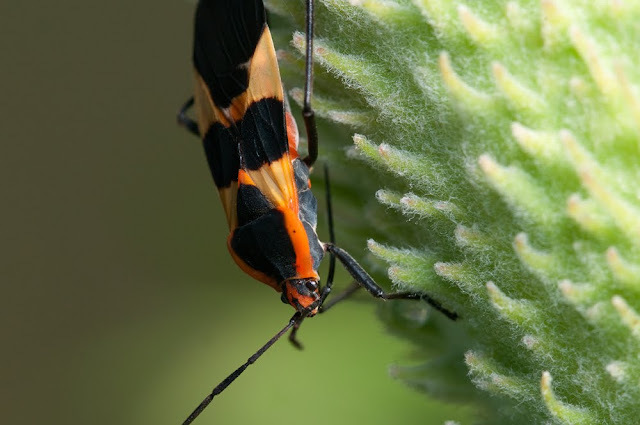 This bug is one of the few insect species that can tolerate the toxicity of the milkweed plant. When the bug feeds on the sap of this plant, the toxic compounds cause it to have a very bad taste, thus discouraging predators. For instance, once a bird eats a milkweed bug, the experience may deter him from doing it a second time. The bright coloring of this insect seems to display a warning to would-be predators. Even the beautiful monarch butterfly is protected by this "warning flag" in the natural world because of his coloring, (the color being very similar to the milkweed bug). As a caterpillar, the monarch also feeds on the milkweed plant, thus consuming the poisonous resin. Birds can become sick after eating too many monarchs so they learn to avoid insects with this coloring. This strategy is called "aposematism", and is employed by many organisms in nature. This defense can also be displayed through odor, shape or sound to avoid being eaten. Interestingly enough, the viceroy butterfly has evolved to look enough like a monarch that predators will leave him alone too! I love discovering these fascinating survival adaptations that are necessary in the animal kingdom! 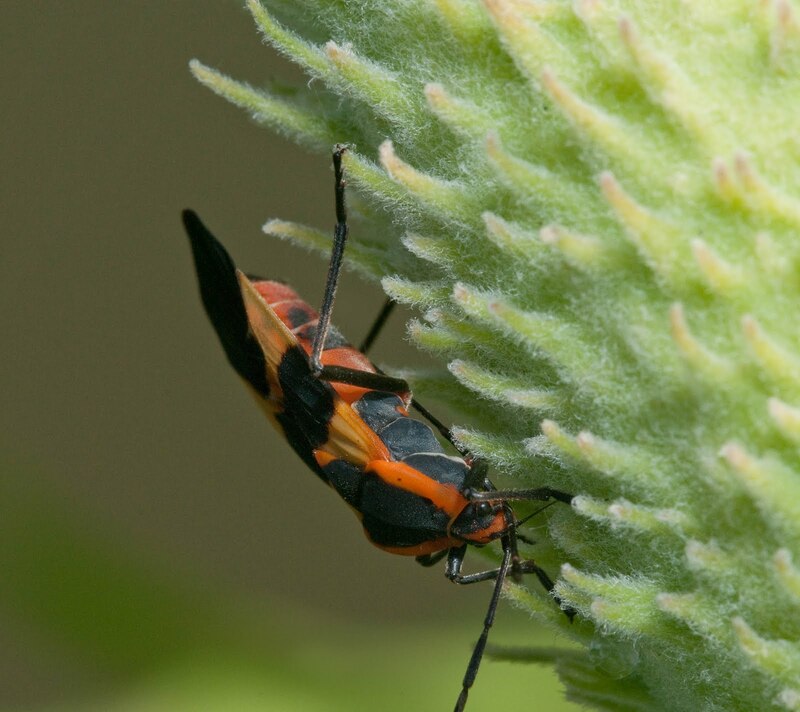 The picture below shows how the milkweed bug penetrates the skin of the milkweed pod to access the seeds inside. As an adult, they utilize their long, sucking, tube-like mouth parts (proboscis) to access the nutritious seeds, while as a nymph they must feed on the surface of the green pod or from the leaves of the plant. I find this picture fascinating! 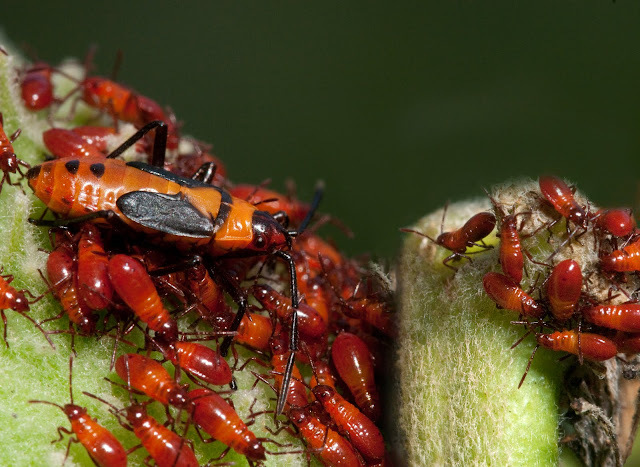 Here is a cluster of milkweed bug nymphs, which are very, very small. They are very brightly colored just like the adult even at this primary stage of their life. You may assume the larger one is the parent, but it is actually a nymph too! They go through 5 stages before they reach maturity. The stages are called "nymphal instars". Each time they molt, or progress to the next stage they become a little larger and more developed. The larger bug is simply in a later stage than the tiny ones-you can see it now has black "wing buds". You may wonder why they are all piled up together. Well, if you remember, their "warning coloration" fends off possible predators, so the more they cluster together, the brighter and more loudly they display this message! As I was observing this group, the little nymph on the right side that is looking at the bigger nymph seemed to make a gesture with his actions, and the bigger one perked up and lifted his antennas. Then the little one hopped over to join him. I don't know if this actually was a form of communication between them, but is was very interesting to watch! Another interesting thing I witnessed: while two adults were mating, another male came inching closer and closer and finally rushed in and knocked the other male away from the female, had a very quick rumble with him and instantly assumed the position that the previous male had occupied. The first male scurried away. I found that interesting enough to mention! Maybe I spend too much time creeping through the milkweed? (I had pictures of this too, but I didn't realize my batteries quit working on my flash, and the photos were too dark).